WSO provides SDN-based domain control of next generation DWDM networks, including alarms monitoring, discovery and asset tracking, equipment commissioning, service provisioning, network assurance, and performance monitoring. This enables granular resource management and control and the ability to efficiently and effectively plan your network to meet your customers’ service needs. netFLEX marks a strategic shift from legacy, fragmented, product specific, network management software, leading the transformation to programmable operations that easily integrate into your business processes. Download our netFLEX Wavelength Services Orchestrator Brochure! A Transport SDN platform that unifies monitoring, discovery, service automation, network optimization and dynamic assurance for delivery of profitable, on-demand DWDM Wavelength services for Global Cloud and Data Center networks. Cloud and IoT operators expect to deliver network services on-demand so they can deploy whatever they need, whenever and wherever they need it. For operators, this means provisioning services, and doing so in a way that makes optimal use of their networks assets, and integrating next generation, best in class, products as they become available. 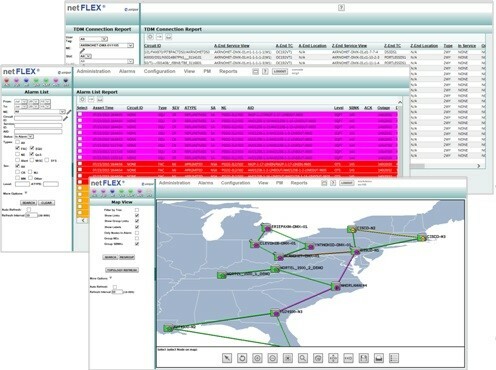 The netFLEX Wavelength Services Orchestrator is an intelligent automation platform combining Multi-Domain Alarms Monitoring and Wavelength Domain Service Awareness and Orchestration with Advanced Analytics for next generation DWDM, OTN and DCI solutions. Built on the foundations of Bell Labs innovation and powered by 21st agility, it provides the extensibility and openness to build intelligent networks for powering the digital age. WSO facilitates the evolution toward more dynamic, highly dense and efficient, modernized network operations and software-defined programmability to accelerate the delivery of on-demand services, reduce costs, and enable a path to increased network autonomy. Drive reconciliation with often error-prone inventory systems via NETCONF/YANG, REST/JSON, MTOSI, or the ASCII inventory interface. Inventory data can be provided for the entire network element, a specific card, or on a specific circuit. Automation and orchestration of network bandwidth services are fast becoming the primary battleground for service providers as they seek to deliver more and better services more quickly to compete. Faster time to market, delivered with simpler network operations requiring fewer highly skilled resources, results in improved cash flow; and a better competitive position, at lower OPEX, and are all attainable with netFLEX WSO.